In 2000, Emilee Floor, pianist/vocalist, was performing regularly in Salt Lake City at the Cinegrill Restaurant. Mayor Rocky Anderson, in his first year as Mayor, would occasion the restaurant with associates to enjoy Emilee’s performance. Soon, Emilee and Rocky got to know each other. Emilee would play the theme from the movie, “Rocky,” and the Mayor would invite Emilee to join his party for a glass of wine. 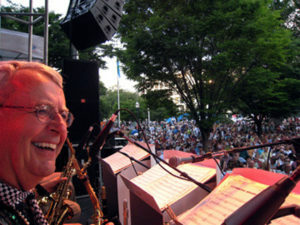 One night, the Mayor said to Emilee, “I sure wish there were more jazz in Salt Lake City.” To which, Emilee responded, “You really need to meet my dad, Jerry Floor. 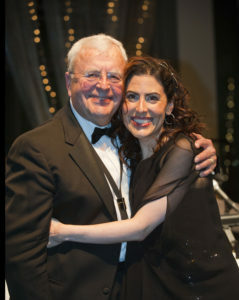 He was involved as a founder of the Park City Jazz Festival and has a lot of great ideas for jazz in Salt Lake City.” Rocky asked Emilee to have Jerry call him. Jerry enlightened Rocky that a free, “first class” festival would require significantly more money and support from the City. The Mayor committed total City support to include help in raising funds to make the event a reality. He instructed Jerry to write a plan that could be implemented in 2001. He also asked for a weather study to determine the best date for the event. 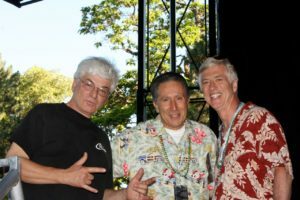 While Rocky and Jerry were politically, polar opposites, a great friendship developed quickly and the Salt Lake City Jazz Festival was born. The structure of the event was for Four Floors Productions, Jerry Floor’s production company, to plan, manage and execute the Festival. Jerry brought Jazz Arts of the MountainWest (JAM), a 501(c)(3) nonprofit into the production team. JAM’s mission was to promote America’s music, jazz, to be performed live and to encourage music education to people of all ages. 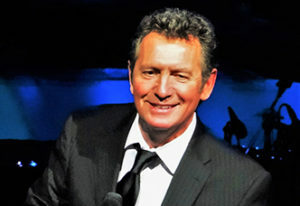 JAM’s involvement was critical to the fund raising efforts for the event. Four Floors Productions formed the production efforts and coordination to produce the event. There cannot be enough said about the board of directors of Jazz Arts of the MountainWest (JAM). Under the past presidents of JAM: Ray Barrios and now, Louie Strike, the Festival has been saved more than once. Louie, president since 2013, has a huge background in business and is a (non-practicing) CPA. He has been a terrific supporter, major sponsor and now, a brilliant addition to JAM. As with all great new ideas, the invention, the details, the economy, the human resources and the technical nuances were all challenges. 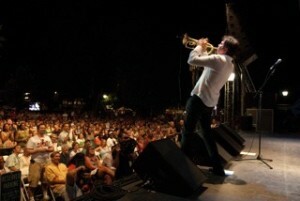 But, with the help of energy and passion, the Jazz Festival became a reality in early July, 2001. The kick-off date was chosen after researching weather conditions and finding that July in Salt Lake City historically had the lowest rainfall of the year. While heat was a factor (90 to 105 degrees F) wind and rain were the death nail in a Festival. The date followed the July 4th weekend. Oddly enough, Friday night, the first night of the first Festival, thunder, lightening, and a tremendous downfall of rain suggested that the research was meaningless. However, after about an hour of a huge volume of rain, the skies cleared, and the audience was still there. The first year’s Festival yielded about 3,500 people. The next 15 years had their share of ups and downs, incredible performances and temperamental weather, political challenges and venue changes. But through it all, our supporters, volunteers, and sponsors have help create one of the finest music festivals in the U.S. 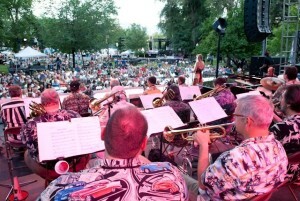 In 2014, we introduced the concept of “Take the music to the people.” The Festival moved back to July, only this time, the Festival developed a new concept – “The Salt Lake City Jazz Festival Road Show.” In an agreement with Sandy City, the first “Road Show” took place on Tuesday of the Festival week at the Sandy Amphitheater. The show consisted of Orquesta Latino and Denny Floor with the Salt Lake City Jazz Orchestra as the warm-up component. Then, Sheila E took the stage for the main show. She was fabulous as always. The “Road Show” concept took further hold in 2015 with Utah performances in West Jordan, Layton, Salt Lake City, Murray, and Sandy. 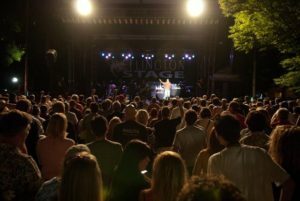 One of the Salt Lake City Festival activities took place with a joint effort at the Utah Arts Festival. Friday at the Arts Festival became Salt Lake City Jazz Festival day with amazing performances by eight jazz ensembles. An addition to the Road Shows, Jazz Arts of the Mountain West produced “America’s Music & Dance,” adding the dance element to the rich heritage that is jazz. The Salt Lake City Jazz Orchestra performed, in concert, with incredible dancers from BallroomUtah at the Road Shows in Salt Lake City, Murray, and Sandy. The performances featured vocalists Lena Prima, Denny Floor and the fabulous Laura Dickinson. 2017 witnessed a grand return for the Salt Lake City Jazz Festival. After a 2 year hiatus, we were back at the Gallivan Center in downtown Salt Lake City with a world-class lineup that featured internationally renowned acts like Eddie Daniels and Lee Musiker, to six-time “Best Entertainer” in Las Vegas and Casino Legends Hall of Famer Bob Anderson.